The impeachment of Rod Blagojevch is ongoing right now, but before we cover that, there are even more pressing items to bring as a public service. Just yesterday, a town in New Jersey experienced a rain of about 5,000 dead birds, falling from the sky, in ones, twos, and threes, whatever. Just a few days ago, there were at least two cases of death from bird flu in Indonesia. Coincidence? I don't think so. It turns out the a USDA had warned the town that it was "culling" some birds -- actually told the Mayor. Well, I asked you, if you were Mayor of your town, what would your reaction to "culling" be? Yeah, me too. Watch out now for culling -- our federal government may be doing it to your town next! Also, just a few days after I posted Noam Chomsky's article on Gaza, Barak Obama gave an interview (last night) on an Arabic Language network, Al-Arabia, the second most influential outlet in the entire Middle East. Further more, he even made sense and sounded rational. It makes one doubt if he really is a U.S. President as such behavior is entirely out of character for any U.S. President (although there are some who state that Eisenhower once said something rational on the subject). Coincidence? I don't think so. This is one more example of the importance of the Absurd Times in the 21st Century. You heard it here first. Now, Saturday Night Live once impersonated Rod Blagojevich but used a stereotypical Chicago Accent. This shows the xenophobia of New York City, in a state that did not like Caroline Kennedy. 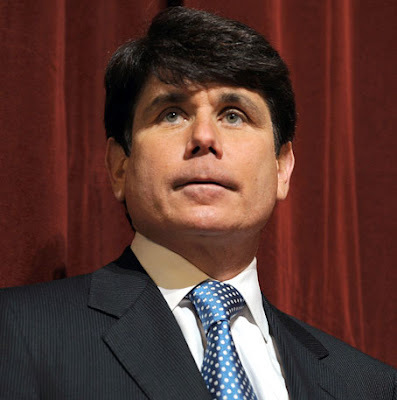 Actually, there are many Chicago accents, depending upon the neighborhood (and Blago now lives in Humboldt Park, sorry about the earlier misinformation. For those of you on the mailing list, I'm attaching a sound track of some of the Chicago dialects, another called "35th and Blago" illustrating the stereotypical accent, and also a track just because I like it. If you are reading this online at the Blog and want a copy, just respond and I'll e-mail it to you. The poor Governor has appeared on any and all media outlets to get his message across. Remember, this was all made possible by a Republican Prosecutor, Fitzgerald who let Cheney and Rove get away with divulging the name of a CIA operative, Valerie Plame. They have been trying to persecute Rod for years because he helped provide less expensive medicine by going to Canada -- and you will remember the recent attacks of Canadian Geese and now know about "culled" birds". They are gong to play a tape today of him shaking down some race track deal. Well, we all know what goes on at the race track, don't we? Corruption. He was trying to fight fire with fire, and that's the tape they will play. Coincidence? Harrumph!